Llama snow angel? Good try, Matthew. I could have used my time yesterday to knit or work on designing. Anything productive. But no. It was blizzarding outside and I wasn't going anywhere and I also wasn't doing anything. I made it through the -6F morning curled up with a blanket watching how bad it was through the window and listening to how bad it was on TV. I briefly went outside to confirm that boiling water does in fact vaporize instantly if you throw it into the subzero air. By the time we reached a daily high of 3F, I had pretty much decided that I was going to spend the day in my PJs and fully appreciate the joy of wool socks. The wind was consistently around 20-30 mph and wind chills were near -30F. Today, by comparison, is lovely. It's 7F already. Heatwave. And there is a glowing spot in the sky. Even though it is still lightly snowing, it's not blowing. I went outside to check it out. And even though it is bitterly cold the snow looks beautiful. Backyard pine trees and sun. Well, almost sun. In the summer these were purple coneflower. The way the snow piled up on these was pretty. It's winter in Western New York. This is what it looked like this afternoon. The camera creates an illusion because with the naked eye, you could barely see the tree and couldn't see the house across the street at all! The weatherguys are predicting 2-3 FEET of snow and really strong winds. Yep, we got a blizzard warning! I took some photos of the monster heart and came up with an idea to use it as a greeting card. 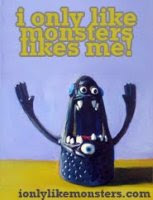 If you've seen the cards I make with my monsters, you know I try to make them colorful, cheerful and fun. I hope this card fits those criteria. It already got pretty good feedback on Facebook so with some minor adjustments, I'm ready to send it to get printed. I think it would be a fun Valentine's Day card. I want to spend this month knitting different shapes. It is weird to try to follow a pattern after years of making up my own. I'm hoping that I can learn some new techniques that I can use to create more fun monsters in the future. I want to try to knit a chameleon next... We'll see!